You probably wonder who this guy, Vaughn Foster Ripley, is… Why he’s started the Healthy Wealthy Tribe… And, why he’s (yes I’m talking about myself in the third person) qualified to inspire you… I’ll use this article as an introduction to my inner-being, and a pathway into my crazy psyche. An Aries baby, I was born on April 12 in 1967. Yes… that was a long time ago! I was born with a rare bleeding disorder called hemophilia. I’m a type-A hemophiliac, which means that my Factor VIII (8) levels are low. My Factor levels fluctuate (this is very rare among easy bleeders) and my level is normally mild with occasional swings into moderate. My levels have never been severe, but I know a bunch of severe hemophiliacs. Suffice it to say that I spent much of my childhood time in the Emergency Room getting Factor VIII to curb bleeding episodes. I believe that my addiction to adrenaline and extreme sports is not only genetic, but directly related to the fact that my parents, siblings, friends, doctors, and teachers all kept me protected and warned me to avoid any contact sports and dangerous activities. For most of my childhood, I listened… Then when I hit about thirteen I decided to follow my own rules. So, I started playing football in the neighborhood. We also played Murder the Man with the Ball. Soccer. Skateboarding. BMX biking. I did most of these things without my parents knowledge. However, my hematologist was no dummy and he knew I was ramping-up the adrenaline games. He tried to counsel me, but I wouldn’t listen. My need for excitement grew with each day! Because of my dangerous sports and hobbies, I started having more bleeds and joint issues. I was in the ER at least twice per week of my entire teenage life. This is the main reason why my knees, ankles, and hips are always so sore. Then, in 1986 (or earlier), I contracted HIV from a bad blood transfusion. My family doctor called my parents and me into his office and told us that I had fewer than two years to live. I was nineteen years old and devastated. I spiraled into a deadly dark place and started drinking and doing drugs. I was heading for a short life in multiple directions. After two years of depression and drug abuse I picked myself up and realized that I wasn’t dead yet. With the help of my wife (then girlfriend), Kristine, I was able to defeat the drug addictions and straighten my life out. A few years later, Kristine and I were married. I had found a career path doing my passion of computers and technology, and I started working my way up the corporate ladder. Circa 2001 I found out I had Hepatitis C and probably had it for most of my life (again from tainted blood). This was disheartening (especially considering all of the drinking I had done), but not the end of the world, or my life. Right around this time, a new medicine regimen was introduced in America that had a 50/50 chance of curing Hepatitis C. The bad news was that the medicine caused severe flu-like symptoms and extreme weakness during the entire procedure; which takes ten months to complete! I didn’t see any options, except doing it. I got on the program and literally suffered through the ten months feeling like I was dying. It was the second darkest nadir of my life (finding out I was HIV+ was numero uno). Sometimes I could not even get out of bed, but I managed to make it through. After I finished the results came back as it working for me. I no longer had Hepatitis C! Finally, a deadly disease that I had acquired was beaten! I was elated (to say the least)!!! Kristine and I decided to have children. A new form of in vitro fertilization, called ICSI was introduced as a viable option for serodiscordant couples (where one person is HIV+ and the partner isn’t). We jumped on the bandwagon, and after five tries we were able to have two healthy children! You can read more about our pregnancy adventure here: healthywealthytribe.com/creating-life-in-a-laboratory. Recently, I published my autobiography in a memoirs format. 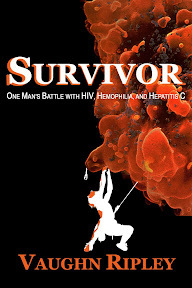 Survivor: One Man’s Battle with HIV, Hemophilia, and Hepatitis C; which details my life story and the crazy life I’ve led. This book started as a journal and legacy that I could leave behind for my children and quickly turned into a full-blown book. After completing my memoir, I realized that I was a writer at heart and started on my first piece of fiction, a cyberthriller titled, Decrypted. This is actually the first of a dozen or so books in a series about a female hacker named, Jessica Carter. Recently I got a literary agent for representation and I’m hopeful to publish my first (of many) fictional books in the near future. Dan, Chris, Vaughn, and Ben about to go out on an adventure. After my daughter, Trinity, was born, I decided to hang up my racing boots. However, I still love riding and do so on a more laid-back Harley Davidson. In more recent years, I’ve started giving inspirational speeches and talking to groups about improving and making the best of life. This belief has led to my inspiration blog posting. Before I started the Healthy Wealthy Tribe, I did regular posts on my first blog, hivlongevity.com. This blog was primarily a resource for people to see how I’ve managed to be one of the longest surviving HIV+ people in the universe. Drop by my About Page for more details. I hope this article helped to shed a little light on me, and gave you a touch of inspiration.